Powerful natural pain reliever derived from chilli peppers called capsaicin. 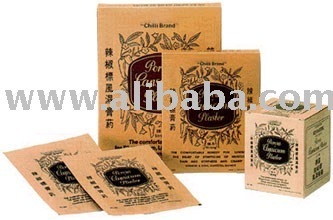 Chilli Brand Plaster is known for its unique warm sensation which stimulates and improves blood circulation. This unique quality provides quick relief to aches and pain resulting from over-exertion, fatigue, stiffness and minor sprains.